On arrival, a warm welcome for all participants and welcome drinks will be provided and participants will be provided with a short introduction on Endau Rompin, and the details on the group activities for the next 2 days. The facilitators and instructors will conduct the session and at the same time get to know all the participants. Participants will be divided into teams and accommodations will then be allocated. Free at leisure until lunch. Lunch at 1300 hours. After lunch, a short briefing and commence trekking to Takah Pandan Water falls and Takah Berangin Waterfalls. Participants will be taught to identify and learn the use of the various plants and herbs found along the route. Much of the medicinal cure for ailments for the aborigines (Orang Asli) are from the roots and leaves of plants found growing wild in the jungle. Return to base camp. Tea time with local cakes and deserts. Free until dinner. Dinner at 1900 hours. After dinner, participants will proceed for night Treasure Hunt. Night Safari by4 wheel drive through the forest expect to see nocturnal animals like civet cats, wild cats, porcupines, ant eaters, owls, rats, wild chicken etc. Supper at 2300 hours. Overnight in chalet twin/triple share. Wake up call at 0630hrs. Breakfast at 0830 hrs. Briefing on techniques and safety procedures for rubber tubing. Water confidence with rubber tubes. First activity, will be 1 hour orientation and leisure tubing from Lubok Selow to Lubok Tapah. Second activity will be, tube racing from Lubok Tapah to Lubok Merekek approximately 1 hour. Lunch break. After lunch, team building competitive corporate games followed by"compete with the Orang Asli" a mind blowing puzzles made with rattan..Tea breaks will be served. Barbeque dinner at 1930 hours. After dinner night line - an exercise aimed at increasing communication level of teamwork and leadership. Supper at 2300 hrs. 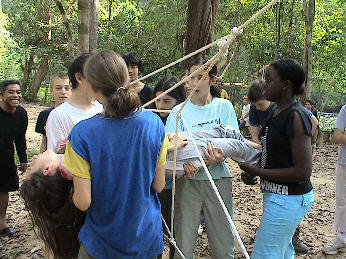 After lunch, a race through 4 obstacles course - confidence rope, spider web, commando crawl and river crossing. Tea break will include debriefing and analysis on the strength and weakness of participants, what went wrong and methods of improvement. Note : The above itinerary is subject to change under normal circumstances that the final itinerary will not be the same as above. Note : The above itinerary is subject to change.